So, here is the Moonlight Falls.world file with the FIXED Resources imported, for people who don't want to mess with their files in S3PE. 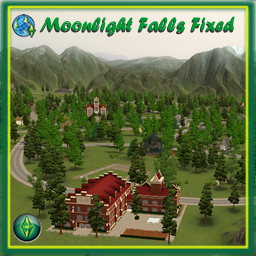 Please read this download thread Resources for Moonlight Falls.world's various Fixes for the stuff that has been done. It might even be worthwhile to take the time to read the Comments of that thread, especially if you encounter issues, just so you can check if it has been discussed and addressed before. Download all parts of the world, and rename them to get rid of the "MTS_ellacharmed_<numbers>_" portion. See Game Help:DFDD4 Download the File#Content with Multi-part fileswiki with pretty pictures. Delete the *.world file. Or if you want to reuse it after patching, rename it with a ".fixed" extension, so the filename becomes "Moonlight Falls.world.fixed"
Made while on Patch 1.38. Would most likely be compatible with any patches in the future as well, as EA has never ever modified a .world file in the updates. Confirmed Patch 1.39 has no changes for the Moonlight Falls.world file, as predicted. The fixes contain 34 modified resources, imported from the other download thread, including the MoonlightFallsRoadIntersections.zip. No multi-parts. Please feedback any issues on this thread as I log in to MTS more often than on Wordpress. This is an experiment; if the account gets flagged for high traffic and exceeds the allowed bandwidth, I have to take it down. So please do download from MTS as a first choice. Additional Credits: S3PE and CAW forums here and elsewhere.